I remember well when my rusty old swing in the back was traded in and in its place, a fancy and shiny blue swing-set with bold white stripes candy-caned around the legs of the set, with a few real swings, and a little swinging carriage for two. It was an awesome sight, but an unwelcome acknowledgement that it was not mine. It was ours, purchased to share with my siblings. This translated in my ears to ‘no longer important’. It was really them who had gained importance, them for whom the swing was bought. I can’t explain sibling resentment. Where did it ferment, and how and why? I only know that it did. I know that swing-set was a turning point, an awareness of competition for a shared outdoor space that I had previously manned alone. Looking at a set of photos snapped during a christmas-present-opening affair, I see the resentment. I wear it in my posture, ooze it from my expression, project it from my eyes, as I hold my Fisher Price schoolhouse, with magnet letters and little peoples; likely comparing it to the shiny twin tricycles that my siblings are excitedly mounting alongside me. 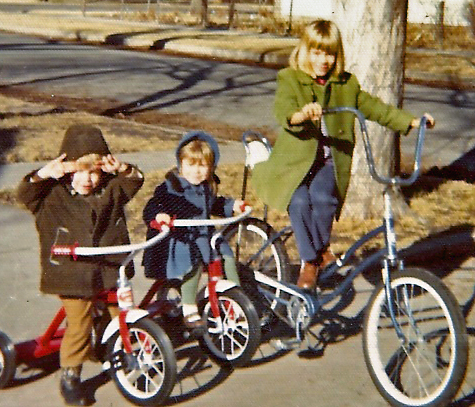 The irony is that there is another picture of Sis and Bro on their trikes, with me alongside them, all dressed in winter gear, and I’m mounted on a lovely blue bike with lovely long chrome handlebars and a beautiful white banana seat. Did I acquire that just after the first picture, or was it acquired during the year, likely for a birthday and posed months later? I couldn’t resist, I went back and looked at that picture and notice that my hairstyle is drastically different and I look a bit older. I would say that it was the next fall/winter when the picture was taken, meaning that the bicycle was likely a birthday present from late summer. It truly does not matter. The fact is, I did not like sharing. My time. My space. My toys. My parents. My yard, my house, mine, mine, mine. I did not like them, can’t make me, I don’t! I’m really just guessing that’s how it was, I really don’t recall. That’s what the picture tells me – the one with the Fisher Price schoolhouse. Honestly? I do not remember the occasion at all. What I recall from the picture is the cardboard fireplace, propped against the wall to hang socks from, to resemble an apparatus an expected jolly fat man might come through. The humor in that does not escape me. Sounds like we have some things in common! Yes I have three siblings, one (a girl) died at birth and I have a younger sister and brother. Being the oldest, I don’t remember much sibling rivalry although I’m sure that is much wishful thinking on my part. While thinking I was the perfect child my mother corrected me in my older years that I was not the dream child I thought I was…lol! Both my parents have passed on, but my brother and sister are the best of friends and we have some really good times together. And I agree that gifts & giving should be as the heart leads…not at the prompting of some fanciful idea. How much trust and hearts been broken when the truth is finally revealed. Seems like something diabolical to destroy faith and trust rather than nurture it. I think your mom was a wise women and looked to the future knowing the pain that would come from a lie. A lot of people today just don’t think…period! “Honestly? I do not remember the occasion at all. What I recall from the picture is the cardboard fireplace, propped against the wall to hang socks from, to resemble an apparatus an expected jolly fat man might come through. Good post over all but I found this interesting. Culture has its perks to be sure, and so does childhood. I’m not sure both can be trusted entirely. As a child we may believe in Santa Claus because our culture (or parents) tells us so. As we grow older we find that things are not as we were told. I’m sure its similar in other cultures. Yet what remains sincere to some degree is our nature…whatever it may be. I’m just curious, do you still hold tight to your own things as you did when you were a child, or have you changed over the years? Thank you for the feedback Dave. I love that my parents (and likely my mom was the culprit) thought to add that garish cardboard fireplace in order to derail any child’s concerns about how the jolly guy was going to get to our house. By contrast, I hate that the farce existed to begin with. I’d prefer to just give gifts when it feels good to give gifts, rather then setting an expectation that feeds the consumerism society and overshadows the simple joy of giving and receiving. Oh my, you’ve outed me! I am still selfish. I don’t like to share certain things that are personal — but our home, portions of our time, our food, we share frequently. We often host family and friend gatherings as well as long-term guests. Strangers might not find me as accommodating, perhaps, as I’ve learned hard lessons from the world around me and trust is hard to earn. Did you have siblings and was there angst between you?